If you are in need of smoke damage restoration call the professionals at Wetherington Restoration and Remodeling. Wetherington Restoration and Remodeling has been helping the communities in Port Charlotte, North Port, Punta Gorda and surrounding areas cleanup and remedy smoke and fire damage for many years. Prompt response will typically reduce the overall damage caused by smoke and fire. We will always respond as fast as possible to help provide you with piece of mind. We work with your insurance company so you can focus on what is important to you. We are licensed and insured and always ready to help when you need us. We are available 24 hours day. After a fire, black marks and discoloration appear on the ceiling, walls and other surfaces of your home. The black marks and discoloration are called soot, which is the residue left by smoke. Soot residue settles onto surfaces immediately after a fire. When porous materials are discolored by soot, the effects are permanent. Discoloration from soot on other surfaces may be cleaned and restored if treated in a timely manner. Acidic soot may become permanent if it is not treated fast enough. Wetherington Restoration and Remodeling is here to help you with your smoke damage restoration needs. The black marks and discoloration from soot residue is may become permanent on all surfaces if left untreated for a length of time. Also, the longer you wait, the longer the restoration process may take which in turn will cost more. If discoloration becomes permanent one of the only alternatives would be to replace the items. 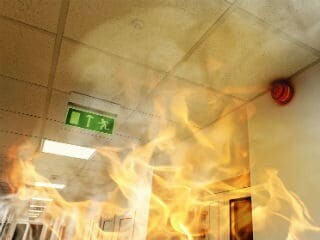 Don’t take the chance of letting smoke damage permanently ruin your property, call Wetherington Restoration and Remodeling today.